Greensboro began the 1980s still in second place population-wise among North Carolina cities, but lost ground to Raleigh, which had overtaken it by 1990 and had a runaway lead by 2000. Over the latter part of the twentieth century, Greensboro would see its manufacturing base shrink and would struggle to redefine itself. In 1980, Greensboro had eight Bestway stores, six FoodRite stores, and five Bi-Rite stores, a total of fifteen locations belonging to the various stepchildren of the old Bi-Rite co-op. Ten years later, that number would be reduced to three, with one store operating under each name. There isn’t much information on the demise of the three names; it must be assumed that they fell victim to increasing chain competition, the strain of the 1970s “breakup”, and the aging of the individual proprietors. It is confirmed that Bestway filed for bankruptcy in July 1985. Today, there is still one Bestway unit, operating in an old A&P constructed in 1947 on Walker Avenue near Elam. One Bi-Rite, now an affiliate of Galaxy Foods, stands in suburban Stokesdale. The Golden Gate Bestway (a former A&P) is now a Harris-Teeter branch, and the Lawndale Drive Bi-Rite became, in 1982, the first in what would become the multi-state The Fresh Market chain (see below). The last new Food World in Greensboro opened around 1982 in the Price Place Shopping Center on West Market Street. This store was actually a relocation of the 18-year-old store just down the street, which had closed at about the same time as the adjacent King’s Department Store. In 1984, the Ruddick Corporation, parent company of the Charlotte-based Harris Teeter stores, purchased the Food World chain from founder George Hutchens. Within a few months, the two chains were consolidated and the Harris Teeter name appeared in much of the Triad and southern Virginia for the first time. Only four Greensboro stores were affected: Summit Avenue, Lawndale Drive, Market Street, and (very briefly) High Point Road. The Meadowview Road branch, which had started as an A&P, closed. Harris-Teeter again expanded through acquisition in 1988, when it purchased the remaining North Carolina and Virginia Big Star stores from Grand Union. The acquisition gave Greensboro two new stores. In addition, Harris Teeter moved into a space vacated by Bestway — and A&P before that — at Golden Gate Center, Kroger (on High Point Road), and FoodRite (on Randleman Road). Late in the 1980s, the branch inside Greensboro’s first Big Bear store (1954) on Lawndale Drive was replaced by a new store farther out Battleground Avenue. By 1990, the chain had eight Greensboro locations. The 1990s brought explosive growth for Harris Teeter as it moved toward a more upscale clientele. The large new Adams Farms branch replaced a smaller branch in a former Kroger superstore on High Point Road around 1991. In 1996, a mammoth new store adjacent to Friendly Center replaced the nearly 40-year-old former Colonial store that Harris Teeter now operated there. In 2006, only ten years after its construction, the Friendly Center store would be demolished and replaced by an even bigger store a block away. Harris Teeter, North Elm Street (Courtesy Harris Teeter). In early 1999, Harris Teeter acquired even more stores in a swap with Kroger (see below). By 2001, consolidations had reduced its store count to six, but almost all of these were massive new stores in desirable locations. Interestingly, the Summit Shopping Center branch, open in 1959 as a Big Bear, remained in the fold until 2002, despite the fact that its demographics had shifted considerably over the years. When it closed, it was arguably the oldest continuously-operating chain supermarket location in Greensboro. The 1980s were not kind to Big Star. Grand Union’s 1978 acquisition of the chain was largely disastrous. A move toward more upscale decor and product selection, accompanied by new signage and graphics didn’t help. The Charlotte area stores were sold to Harris Teeter in 1984; the remainder of the North Carolina and Virginia operation followed suit in 1988. Only two Greensboro stores actually took the Harris Teeter name, a relatively new branch on College Road (which had been the last new build in town to open under the Colonial Stores banner), and the Friendly Center store. An early 1980s store on Randleman Road closed due to its proximity to an already-open Harris Teeter. The Cone Boulevard store, adjacent to a Kmart near the already-troubled Carolina Circle Mall, closed as Big Star. Food Town (renamed Food Lion in 1982 to facilitate expansion into areas served by a preexisting Foodtown chain) was North Carolina’s big retail success story of the 1980s. From one Greensboro store in 1975, the chain had grown to six by 1980, nine by 1990, and ten by 2000. 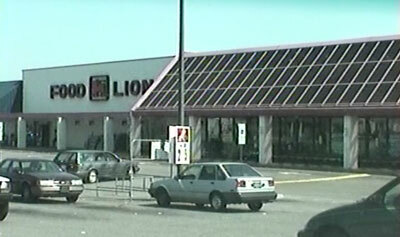 Food Lion, former Kroger, 4655 West Market Street (2001 photo). Many of the initial stores were conversions of old A&P and Kmart Foods locations, but most open after 1980 were new builds. One notable exception was the store at 4655 West Market Street, which had started as King’s Department Store, and then spent fifteen years as a Kroger greenhouse store. In 1980, Kroger had four Greensboro locations. Three of them were 1970s superstores, while one on Asheboro Street dated from 1959. It was, not surprisingly, the first to close, early in the 1980s. The High Point Road superstore closed shortly afterward and reopened as a Food World, and later Harris Teeter. The High Point Road Kroger actually didn’t close, but relocated a few blocks north into the former Family Mart store at the corner of Holden Road. Family Mart stores in Greensboro, Winston-Salem, Columbia SC, and other southern cities were sold off when A&P finally abandoned these markets around 1983. Around the same time, Kroger also relocated its Market Street superstore into the former King’s Department Store several blocks west. The old department store space was remodeled into Greensboro’s only two Kroger “greenhouse” stores. The other was in a new shopping center at Battleground Avenue and Westridge Road on the northwest side of town. In the 1990s, Kroger went on an expansion binge in Greensboro and the Triad. The final superstore at Palmer on Yanceyville Street was replaced in 1995 by a new store a block west on Church Street. The West Market Street store, already located in a converted department store, moved across the street to a vacated Kmart unit and became (for a time) the largest supermarket in North Carolina, at 78,800 square feet late in 1996. Another new store opened around this time in the growing Wendover Avenue/I-40 retail corridor, on Bridford Parkway. The new stores were huge and attractive and well-sited, but the investment did not result in the market share Kroger sought. On 2 April 1999, the company announced that it was selling its ten Triad stores to Harris Teeter. At the same time, Kroger acquired eleven Harris Teeter stores in southern Virginia. The Kroger name disappeared from the Triad after more than fifty years when the last stores were converted to Harris Teeter in July 1999. Ironically, kroger would re-acquire some of these properties fifteen years later with its purchase of the Harris Teeter chain (which has retained its own identity). Winn-Dixie started the 1980s with four Greensboro locations, two of them more than twenty years old (but expanded) and two dating from the early 1970s. A new store opened on Lawndale Drive in the northwest late in the 1980s, and another on Holden Road in the the southwest opened in the early 1990s, about the same time the Four Seasons Mall store closed. In December 1994, Winn-Dixie relocated its Cone Boulevard store into a former Zayre Department Store location in the same center. The 52,000 square foot “marketplace” store continued a trend started in Charlotte several years earlier, where a former Woolco store had been similarly converted. Unfortunately, Winn-Dixie’s site selection reflected its rather haphazard approach to demographics. Customers were feeling the chain which seemed to have no idea who its customers ever were at that point. The Friendly Center store closed in 1999, after 37 years. Most of the others were also gone by the time Winn-Dixie finally pulled out of North Carolina — and much of the southeast — in 2005. 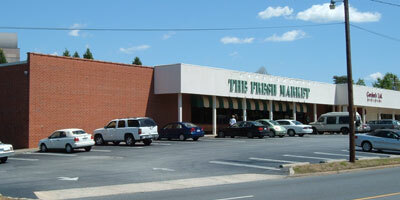 The very first Fresh Market, Lawndale Drive. In 1982, San Francisco native Ray Berry opened the first Fresh Market store in a converted Bi-Rite on Lawndale Drive, in the affluent and growing northwestern quadrant of the city. The store emphasized high quality and fresh foods sold in a pleasant and upscale environment. A few years later, a second Greensboro location opened in a former Winn-Dixie (later Bestway) near Guilford College. The chain was also expanding statewide. As of 2007, the Greensboro-based chain has 65 stores in 18 states. Winston-Salem based Lowes Foods came to Greensboro late in the 1990s, taking over a Buy for Less store in a former Zayre department store location on High Point Road. This store lasted only a few years, but several others in more desirable locations have fared better. 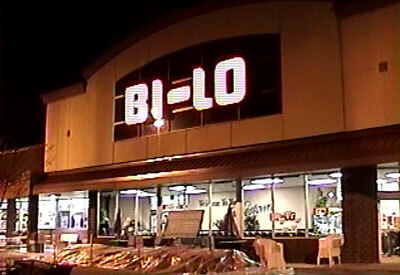 Bi-Lo, a unit of Ahold which had previously operated in South Carolina and the Charlotte area, came to the Triad in 1995, with stores in High Point and later Greensboro. Ultimately, the chain opened a total of two or three stores in Greensboro, all of which were sold to a grocery wholesaler in 2005 and renamed Southern Family Markets. The Southern Family stores lasted barely a year, and only one has been taken over by another chain, the former Super Bi-Lo on Lawndale Drive, which reopened as a Harris Teeter in 2007. Stores combining groceries and general merchandise had been pioneered in Greensboro by Clark’s in the 1950s and by Kmart on the 1960s, but the concept had fallen out of favor by the 1970s. A new contender, Memco, tried again beginning in 1980. Memco, a division of California-based Lucky Stores had operated Gemco stores on the west coast for years, and had started the Memco chain (renamed on the east coast due to the preexisting GEM stores) in the 1970s. The “membership” gimmick and merchandise pairing just didn’t work in the southeast, and the Greensboro and Winston-Salem stores closed after just a few years. Kmart, however, got back in to the grocery business with the first (and ultimately the only) Greensboro Super Kmart store in 1995. It was followed soon afterward by the city’s first Wal-Mart Supercenter just across the street, a few years later. The Super Kmart location shed its grocery operation around 2010 and closed completely in 2014. As a high school student I worked at the Kroger’s Golden Gate store starting in March of 1973. It closed later that same year when the new Palmer Plaza superstore opened..